ADB-FUBINACA is a designer drug identified in synthetic cannabis blends in Japan in 2013. The (S) enantiomer of ADB-FUBINACA is claimed in Pfizer patent WO 2009/106982 and has been reported to be a potent agonist of the CB1 receptor and CB2 receptor with an EC50 value of 1.2 nM and 3.5 nM respectively. ADB-FUBINACA features a carboxamide group at the 3-indazole position, like SDB-001 and STS-135. ADB-FUBINACA appears to be the product of rational drug design, since it differs from AB-FUBINACA only by the replacement of the isopropyl group with a tert-butyl group. One death through coronary arterial thrombosis has been linked to ADB-FUBINACA intoxication. An analogue of ADB-FUBINACA, ADSB-FUB-187, containing a more functionalized carboxamide substituent was recently reported. ADB-FUBINACA is a synthetic cannabinoid that has recently been identified in herbal blends. Its name refers to its structure, which has a 1-amino-3,3-dimethyl-1-oxobutan-2-yl (ADB) group linked to a 4-fluorobenzyl-1H-indazole-3-carboxamide (FUBINACA) base at the amide group. The physiological and toxicological properties of this compound have not been determined. This product is intended for forensic and research applications. 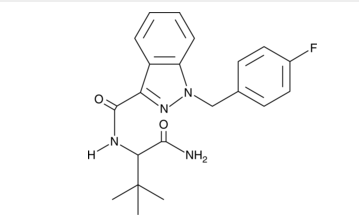 The enantiomer of ADB-FUBINACA is claimed in Pfizer patent WO 2009/106982 and has been reported to be a a potent agonist of the CB1 receptor and CB2 receptor with a EC50 value of 1.2 nM and 3.5 nM respectively. The physiological and toxicological properties of this compound have not been determined. This product is intended for forensic and research applications.